From FOX Sports On MSN - NASCAR will test drivers for performance-enhancing drugs next month under a tougher policy that also bans using illegal drugs and abusing prescription medications. NASCAR likely will test drivers the third week of January, and crew members must submit results from an approved lab by Jan. 16, according to documents obtained Thursday by The Associated Press. A NASCAR memo sent to teams lists specific banned substances for which crew members must be screened. No similar guidelines were issued for drivers, as NASCAR reserves the right to test competitors for anything. Under the old policy, NASCAR had the right to randomly test based on suspicion of abuse. Under the tougher guidelines first announced in September, everyone will be tested before the season begins, and random testing will continue throughout the year. NASCAR expects to randomly test 12 to 14 individuals per series each weekend in 2009. The guidelines were strengthened in part because of former Truck Series driver Aaron Fike's admission that he had used heroin — even on days he raced. That led Tony Stewart, Kevin Harvick and other veteran drivers to call on NASCAR to add random drug testing to its policy. The memo, dated Dec. 8, is the first time the new policy has been laid out in writing and specifies who falls under the guidelines. Those who must be tested before Jan. 16 include: pit crew members, including "over-the-wall" crew members, the crew chief, car chief, team members responsible for tires, fuel and pit crew operation, spotters and race-day support personnel that includes engineers, engine tuners, shock specialists, chassis specialists and tire specialists. * Seven different amphetamines, including methamphetamine and PMA, a synthetic psychostimulant and hallucinogen. * Three drugs classified under ephedrine. * 13 different narcotics, including codeine and morphine. * Ten different benzodiazepines and barbituates. * Marijuana, cocaine, zolpidem, nitrites, chromates and drugs that can increase specific gravity. No such list exists for the drivers, but spokesman Ramsey Poston confirmed NASCAR will test for performance-enhancing drugs. The driver testing, which will be administered by NASCAR, had been scheduled for preseason testing at Daytona next month. But because testing has been suspended for 2009, NASCAR likely will screen drivers when most are in Charlotte next month for the annual media tour of race shops. The gap in the drug policy was exposed last September when Truck Series driver Ron Hornaday Jr. admitted he used a testosterone cream during 2004 and 2005 to treat a medical issue. Hornaday has Grave's disease, a condition he's treating with Synthroid, which replaces a hormone normally produced by the thyroid gland to regulate the body's energy and metabolism. NASCAR did not punish him for the testosterone admission, saying the cream did not enhance his performance or impair his judgment. 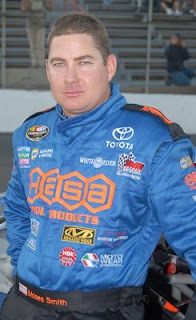 Moses Smith races the #16 Hasa Pool Products Toyota in the Camping World Series West. The Camping World Series has been entitled NASCAR's top developmental series. Over the years, this series has helped launch the careers of many future NASCAR stars, including current NASCAR Sprint Cup Series standouts Kevin Harvick, Martin Truex, Jr., and David Gilliland, along with two-time championship crew chief Greg Zipadelli. Recent enhancements to the series included a schedule with an expanded geographic reach, new competition and cost-containment initiatives such as the new "spec engine" and composite body, and a lowered age-limit to 16 for drivers. Should NASCAR's new drug testing policy filter down to their developmental series - The Camping World Series - East and West? Vote in the poll located on the right side bar and let your voice be heard.